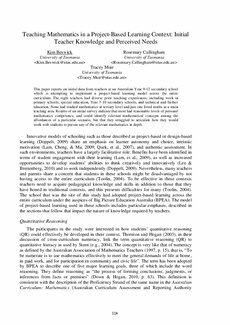 This paper reports on initial data from teachers at an Australian Year 9-12 secondary school which is attempting to implement a project-based learning model across the entire curriculum. The eight teachers had diverse prior teaching experiences, including work in primary schools, special education, Year 7-10 secondary schools, and technical and further education. None had studied mathematics at tertiary level and just one listed maths as a main teaching area. Results of an initial survey indicate that most had reasonable levels of personal mathematics competence, and could identify relevant mathematical concepts among the affordances of a particular scenario, but that they struggled to articulate how they would work with students to pursue any of the relevant mathematics in depth.